’; a song written by Dan Smith (aka MC Pressure) as his son underwent treatment for leukaemia. The film harnesses mobile and digital technology to show a world turned upside down. Rotating and tilting high-spec Android phones reveals a father and son’s journey through two 3D animated environments – the dark representing fear and the light representing hope. In the desktop version, navigation is controlled via trackpad or mouse. “Through The Dark was inspired by my son’s fight against leukaemia; it's a story of hope and perseverance throughout the journey of his recovery,” Smith says. The interactive film is driven entirely by code with 3D environments rendered in real-time with WebGL. This enables users to choose their own experience of the story based on the orientation of their device. “This is a deeply moving story and a powerful song that had to be brought to life in a way that conveyed the emotional journey at its heart,” says R/GA Sydney executive creative director Hamish Stewart. “We wanted to push the capabilities of mobile to their limit to do it justice. ‘Through The Dark’ is part of Google’s commitment to supporting Australian artists with projects merging art and technology to create innovative music experiences. Past launches include ‘The Cube’ for The Presets ‘No Fun’, and ‘Playing With Fire’ for Elizabeth Rose. “For anyone that’s been to a Hoods concert, hearing this song live is a magic moment. We wanted to recreate that feeling for anyone, no matter where they were, to give depth to the musical experience and help raise awareness for young people living with cancer in Australia,” says Google Australia’s Sophie Hirst. 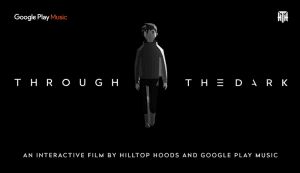 R/GA Sydney has partnered with the Hilltop Hoods and Google Play Music to create the interactive film ‘Through The Dark’; a song written by Dan Smith (aka MC Pressure) as his son underwent treatment for leukaemia.